When I think about teaching standards I think about what I want for my own children and all students that will move through the Waterford Graded School District. I look at the standards themselves and ask if they are good for our children or not. While I realize there is a roaring political debate about the Common Core teaching standards, I am constantly reminded that those discussions are filled with misinformation and over simplification. I believe that if we want to have an intelligent and meaningful discussion we should avoid the “politics” and look at the standards themselves. Recently, a friend sent me a link asking for my opinion about a sponsored (paid) post she saw on Facebook. The post is from one of the candidates for the WGSD school board. You can click on the post image to enlarge. 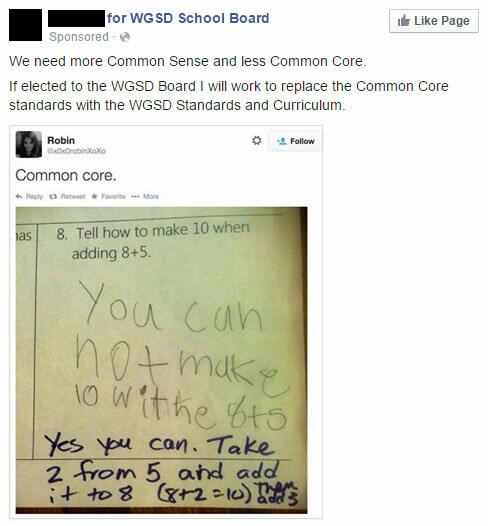 The candidate states that he will “work to replace the Common Core standards…”, but he does not say why. He states “We need more common sense…”, but at the same time his post implies that he is opposed to what is called number sense. How can that be? Perhaps the candidate has no idea that the displayed math problem is intended to test a student’s number sense. I won’t disagree that the question could have been worded better, but assuming it is a real question and not fabricated, the confusion is the fault of the teacher, not common core. This particular number sense strategy is called make 10, and is similar to other math strategies like counting on and doubles. An experienced math teacher will tell you that number sense strategies have been in use for decades, and well before Common Core came into existence. If these number sense strategies are new to you, please read about some basic strategies by clicking HERE. As I try to understand the purpose of the candidate’s post, I can’t help but wonder if he really wants to stop students from developing number sense. Maybe he mistakenly believes this math question was intended to determine if the student had memorized the sum of 8 and 5? Let’s look beneath the surface and get to the standard in question. The now infamous math problem above is just one way to determine if students have met a first grade math standard for “operations and algebraic thinking”. Pasted below is the actual Common Core standard and in yellow we can see the “make 10” reference. If a candidate is opposed to teaching these number sense strategies for addition then that is where they should start. For the record, I think we do need to continue to teach number sense strategies in our schools. I think teaching number sense is common sense. I want my children to be able to manipulate numbers at an early age so future challenges are much easier to understand. For example, knowing the fact family for 8, 2, and 10 will prepare students for basic algebra where they are asked to solve for “X” in the equation “8 = 10 – X”. Knowing the fact family for a set of numbers is inherent in the exact same standard referenced above – see my red highlight. “Show how to get an answer for adding 8 + 5 using the “make 10″ strategy we practiced in class”. Stating the question more clearly not only helps the student, it would also help the parent at home better understand the goal. Of course, we don’t really know what directions were stated at the top of the page so maybe the directions were obvious. Again, for those of us who have talked with our children’s math teachers, or who have education backgrounds, the question is easily recognized as an assessment of a student’s number sense. For or Against Common Core? I don’t have a strong opinion for, or against, adopting the Common Core standards as our “official” district standards. The Common Core standards are meant to serve as a floor, a minimum set of standards that all districts nationwide should work to meet. I do think there is value in knowing how a school district in one state compares to a school district in another state. I think that is a smart national strategy. I would also expect our district to exceed those standards wherever they fall short. Common Core certainly is a contentious issue and if I am elected to the school board I will ask the other board members to join me in organizing a community forum where the Common Core standards are addressed. I would encourage community members to bring their questions, along with the lessons and assignments that are causing them concern. Our district administration and building principals can then answer the questions to the best of their ability. If their answers are not sufficient to the community, then changes will need to be made. The community will also need to be made fully aware of the additional cost and staff time required to replace the existing standards if that is the intended goal. Some people argue that the “old school” math is best and the “new math” stinks. They argue that they can’t help their kids with their homework and that students should still be required to memorize basic math facts (like addition and subtraction). Some refer to this debate as “Math Wars” and the debate has been going on for over 20 years. Take a look at this “Math Wars” article that is already 12 years old. While many of the “reform math” ideas discussed have since been improved upon, a similar argument continues today. Ironically, the memorization some are referring to is the intended goal of number sense. When students aged 4, 5, 6, and 7 learn these basic number sense strategies for addition they will memorize those traditional math facts much quicker than without. They will enjoy an entirely different understanding of numbers that will help them later on as they learn multiplication, division, algebra and other higher math concepts. My hope is that as more parents and community members look into these standards they will better understand why they are in place today. I hope you will join me in bringing some much needed detail to the issues surrounding common core and our learning standards. You can help us have a more informed community by “Sharing” this article on Facebook and by email. You can also be sure to vote on April 7th, or earlier with an absentee ballot.